Exxon Mobil Corporation, a New Jersey corporation was incorporated in 1882. The Company's main business is energy, involving exploration for, and production of, crude oil and natural gas, manufacture of petroleum products and transportation and sale of crude oil, natural gas and petroleum products. It is also a manufacturer and marketer of commodity petrochemicals, including olefins, aromatics, polyethylene and polypropylene plastics and a wide variety of specialty products. In order to arrive at the owner's earnings, I have added the Depreciation, Depletion and Amortisation' expenses back to net income. 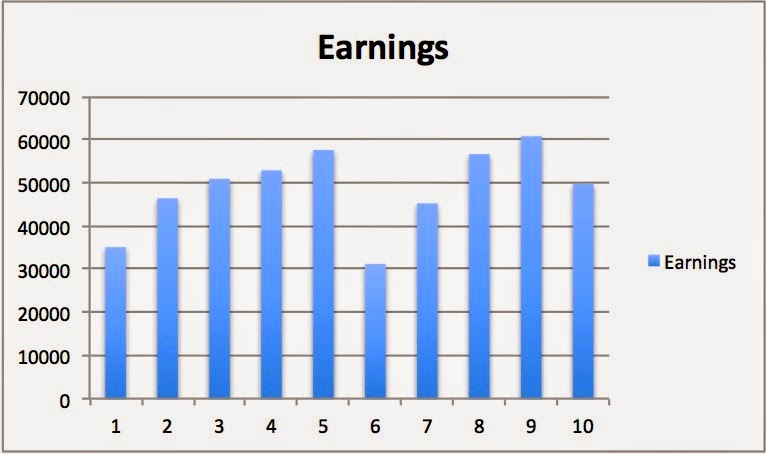 The table below shows the earnings in the last 10 years. In the last 10 years, the absolute earnings have increased at an average of 7.58% and at a CAGR of 3.55%, which puts it in under 'Slow growers' category. Due to the effect of share buybacks, the EPS on the other hand has grown at an average of 13.38% and at a CAGR of 6.60%. In the last 10 years, XOM has spent an average of 40% of earnings on capital expenditures. The capital expenditure includes amount spent on 'Purchase of property, plant and equipment'. XOM has raised dividends for 31 years in a row, which meets my investment criteria. 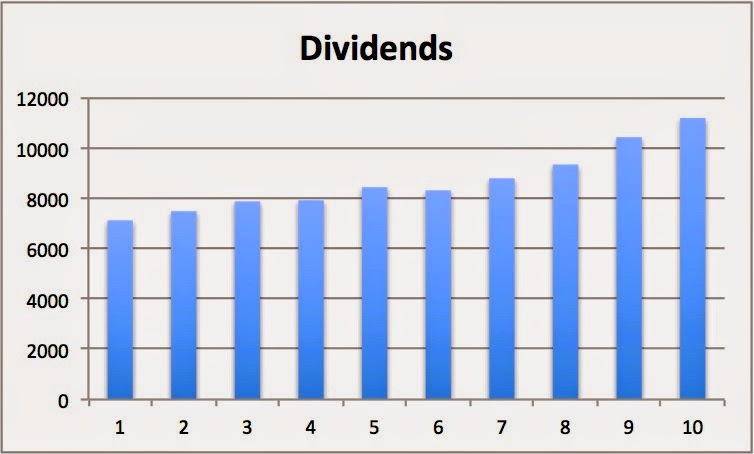 The graph below outlines the dividend growth rates in the last 10 years. In the last 10 years, the dividends have increase at an average of 6.34% and at a CAGR of 4.6%. Due to the effect of share buybacks, dividend per shares on the other hand has grown at an average of 9.88% and at a CAGR of 8.8%. 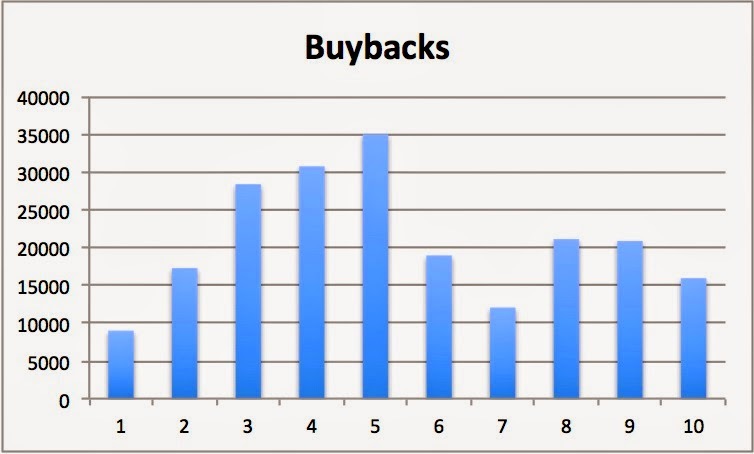 The graph below outlines the total amount of money XOM has spent on buybacks. Although, XOM is involved in an industry with heavy capital expenditure, it hasn't raised cash by offering shares, which would have resulted in share dilution. Instead, XOM has been able to manage to bring down the total number of outstanding shares (diluted) from 6,511.6 million in 2004 to 4,297 million in 2013. 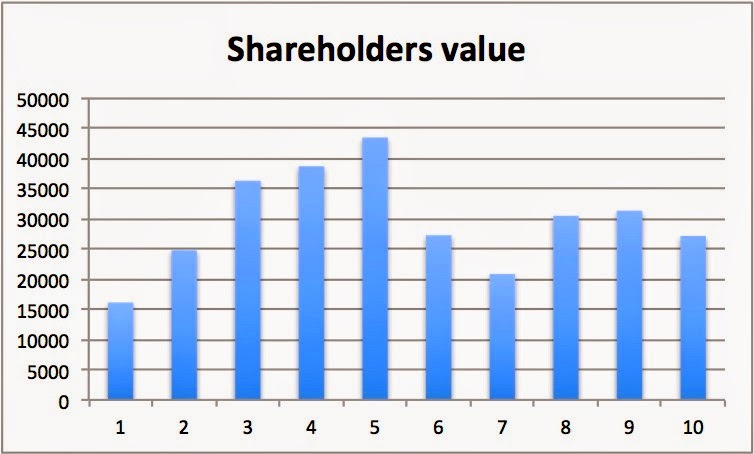 This demonstrates the management's focus on creating value for the shareholders. The graph below outlines the total amount XOM has returned back to shareholders in the last 10 years. On an average XOM has been able to return 57% of its total owner's earnings to shareholders through dividends and share buy backs. 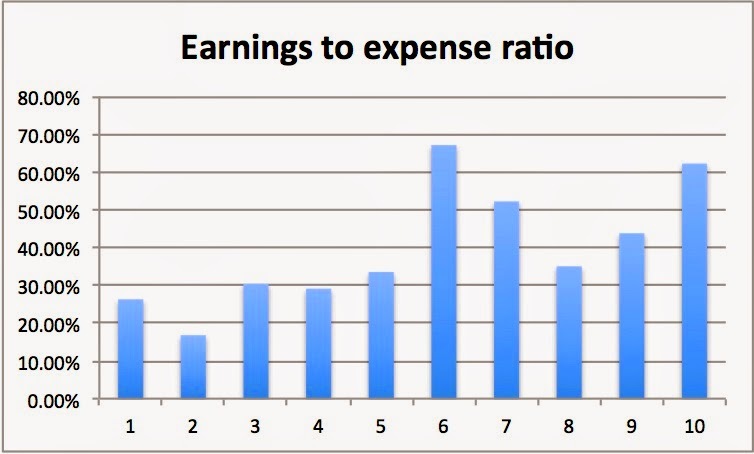 The total liability to earnings after capital expenditure is 5.59 which is phenominal. The oil, gas, and petrochemical businesses are fundamentally commodity businesses. This means ExxonMobil’s operations and earnings may be significantly affected by changes in oil, gas and petrochemical prices and by changes in margins on refined products. The demand for energy and petrochemicals correlates closely with general economic growth rates. The occurrence of recessions or other periods of low or negative economic growth will typically have a direct adverse impact on earnings. As noted in the year 2009, the global economic environment can impact its growth and profits when earnings took a hit. The current market cap for XOM stands $421 billion and at a trailing P/E ratio of 12.60. At current share price ($98.73) XOM delivers a dividend yield of 2.70% and shareholders earnings yield of 7.54%. Based on my valuation, I believe XOM is currently attractively priced at $98.73 for long term investment.